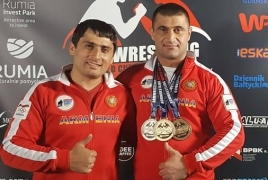 PanARMENIAN.Net - Major of the Armenian Armed Forces, athlete Sargis Stepanyan, who lost both legs and right hands in 2014, won two medals at theWorld Armwrestling Championshipfor the disabled to become the champion, Stepanyan himslef said in a Facebook post. Stepanian claimed the champion's title among athletes with musculoskeletal problems who competed in the Polish city of Rumia. He won two gold medals in 75 kg and 80 kg weight categories, also snatching silver among heavyweight athletes. The championships were held on November 18-21.